During the vacation over the last few weeks I had the opportunity to visit the Sentry Box in Calgary. Apart from two, out-or-print, individual 40K figures, a pack of Reaper Bones Familiars, and some GF9 "Snow" the bulk of my purchases were GHQ micro armour. I picked up four battlegroup boxes (though one is for a friend) and a couple packs of individual infantry. While I have been planning to get back into Cold War gaming with micro armour for some time, this was a bit of an impulse purchase. I have LOADS of stuff to work on for this year. I was thinking I'd maybe pick some stuff up next year... but then I was there... and they had these... and... well... you know how it goes. 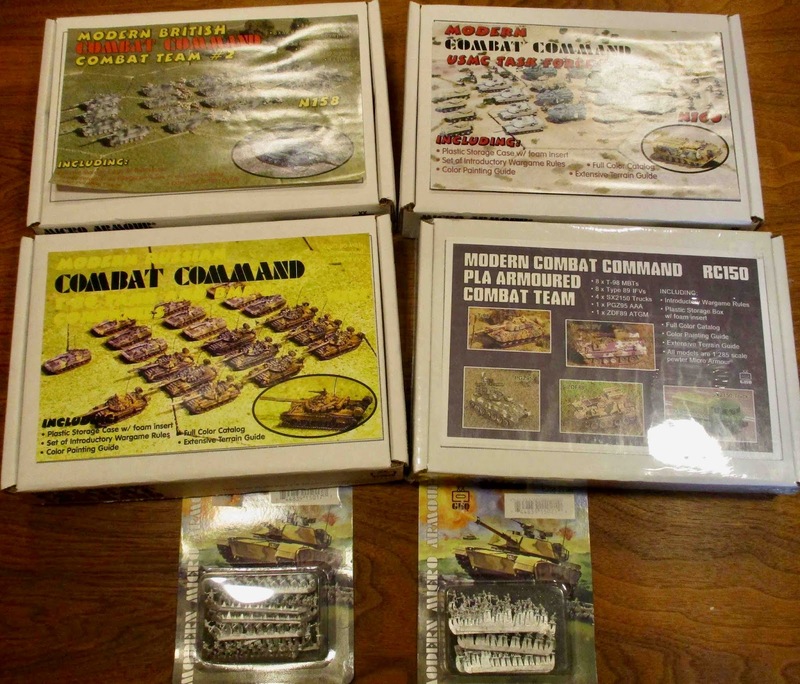 They DID have a box of Soviets with T-72s and BMP-1s, but as the opposing forces I had to chose from were a little more recent, I opted for the T-80/BMP-2 set. I tried to pick up four battlegroups that could potentially all fight each other... well... Maybe not the British and USMC... but you never know...? The British and USMC could fight the Soviets in a early 90s (Extended) Cold War Goes Hot scenario - where the Soviet state didn't collapse and the Berlin Wall didn't come down in 1989. The Soviets could fight the Chinese in a border conflict. The British could fight the Chinese over Hong Kong? The USMC could face the Chinese in Taiwan - or a number of other potential conflict zones in the Southwest Pacific region... Or maybe even in a Chinese invasion of Hawaii...? Micro British infantry armed with SA-80 assault rifles. Cold War Commander, which I plan to use with these, is supposed to be scalable. 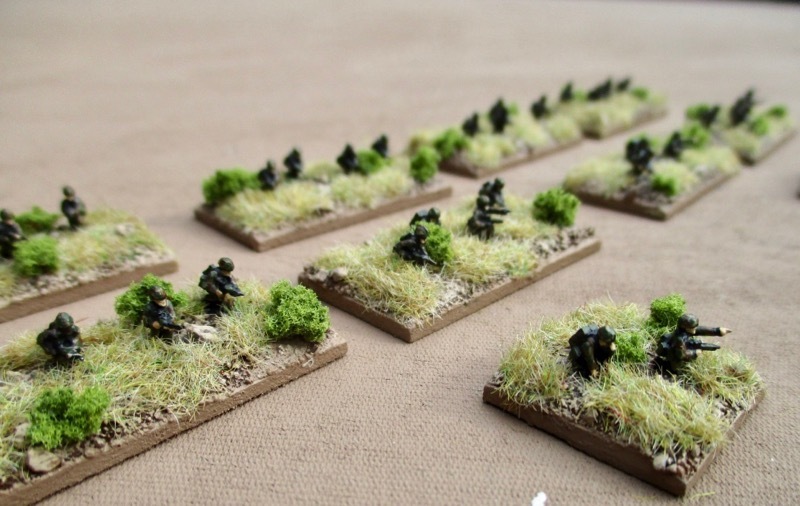 Elements bases could represent either platoons/troops or squads and individual vehicles. I find it a bit abstract for representing individual vehicles. So these will most often be used as platoons - making this a force of approximately two companies. The two smaller stands could be headquarters or artillery forward observers or forward air controllers. 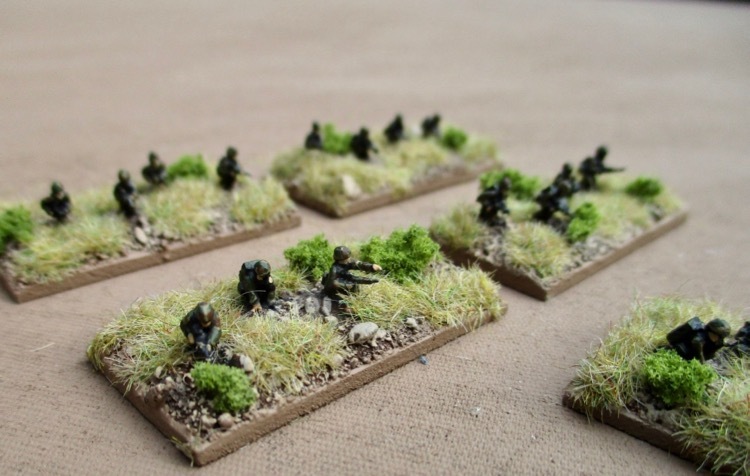 Here they are with a pair of 28mm British troops of the same era - for comparison. If I had to guess, I'd say the Modern Micro British armour would probably come next - they're quick, they're easy and there is a limited number of them and finishing them will complete a playable force. I'm interested in seeing your progress with the Micro Armor. I've been tempted, but have never done much with the wee little guys. I love the armor, but worry about the barrel's durability. As I base everything, maybe that isn't much of a concern. I'll have pics of the Challenger 2s up on the blog tomorrow. The barrels are indeed very spindly! 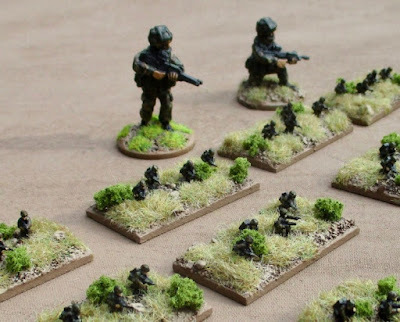 But I have them on bases as well and I hope that will protect them from too much bashing about! Nice rapid work,bit of a change from 28mm+ 40k! That shop sounds great,bad for the pocket though! It was pretty hard on the pocket book, indeed! I tired to show a little restraint - limit myself to stuff that was out or print or otherwise unavailable or difficult to get for my local game store... alas... they still have SO MUCH STUFF!! !